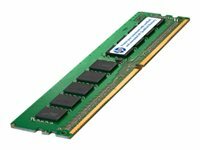 Are you looking for enterprise-quality server memory at a lower cost? Small and medium business owners often must choose between the need for high-performance server memory that supports their workloads and the simultaneous desire to control capital and operating expenses. With HPE DDR4 Standard Memory, you don’t need to choose between performance and cost efficiency. HPE Standard Memory options are designed to deliver performance, reliability and efficiency at an affordable price. Unlike third-party alternatives, HPE Standard Memory is sourced from the highest-quality DRAMS and undergoes a rigorous testing and authentication process. This extensive testing ensures that it is completely compatible with and optimized for entry-level HPE server platforms to perform to industry-defined specifications. HPE DDR4 Standard Memory performs at industry-standard speeds. HPE DDR4 Standard Memory has built-in intelligence (advanced error detection) to improve performance, reduce downtime and lower energy costs. HPE DDR4 Standard Memory provides excellent quality and support for HPE ML Gen9 and DL Gen9 10/100 servers. Quality and reliability is engineered into every HPE DDR4 Standard Memory product. HPE DDR4 Standard Memory is an affordable solution for small and medium business and remote and branch office customers. HPE DDR4 2400 MT/s Standard Memory modules reduce power consumption by up to 20% in comparison to DDR4 2133 MT/s memory modules.